Here is another round of Cebu Pacific sale ticket you might be interested to avail! Book tickets for flights to select domestic destinations for as low as P1,099. Booking for local trips can be done up to June 17, 2018 or until seats on sale last. 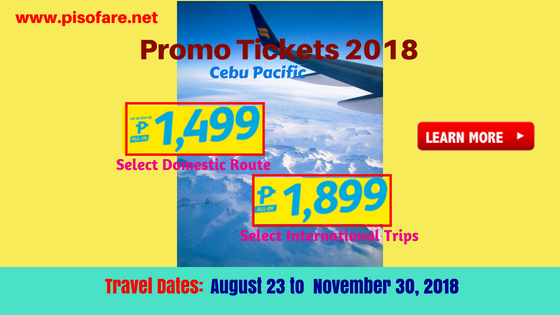 Cebu Pacific domestic promos are good for trips from August 23 until November 30, 2018. As for the Cebu Pacific international seat sale, cheapest fare is P1,899 for Manila to Jakarta flight. Low fares also available for Taipei, Siem Reap and few other foreign routes. Foreign flight promos travel dates starts September 12 and ends on November 30, 2018. Cebu Pacific promo tickets are limited and may not be available on all flights. To get the Cebu Pacific promos, go online at www.cebupacificair.com and book without using a promo code. Another way of availing the affordable fares is by purchasing tickets at Cebu Pacific sales/ tickets offices and accredited travel agents and booking offices. You may also book the low fares by calling the airline hotlines in Manila (02) 7020888 or Cebu (032) 2308888. Office hours is 7AM to 10PM, Mondays to Sundays. Cebu Pacific also offer exclusive discounts when you a package: flight + hotel for your travel getaways. Do you need travel promo updates? Then, Like and Follow us in Facebook: PISO FARE TICKET!